Angel Gilberto Garcia-Avalos had been deported five times in just the past four years, yet each time he has managed to sneak from Mexico back into the U.S., where he ended up in more mischief: driving without a license, attempted burglary and felony weapons charges. In August, he graduated to full-fledged mayhem, sparking a fire in the Sequoia National Forest that has already cost the government $61 million and left some of the country’s most beautiful landscape scarred for years to come. WOFFORD HEIGHTS, Calif. — Angel Gilberto Garcia-Avalos had been deported five times in just the past four years, yet each time he has managed to sneak from Mexico back into the U.S., where he ended up in more mischief: driving without a license, attempted burglary and felony weapons charges. Garcia, who pleaded guilty last month and faces 13 months in prison, had only recently been released from the Kern County Jail. He likely would have been deported again, but local authorities were unable to report him to immigration authorities because of California’s new sanctuary city law, which prohibited the sheriff from communicating with federal agents. Federal agents now say they will kick Garcia out of the country once he serves his latest sentence, but the damage has already been done. At a point along State Highway 155 through the Sequoia National Forest, the smell of cedar gives way to the stench of soot. Ash-blackened trees above and below the roadway show the path of the blaze. Investigators determined that the spark came from a Nissan Maxima that Garcia was driving over a rough dirt trail near Cedar Creek. Garcia tried to drive over a berm and hit a tree. The hot muffler on his car ignited grass parched by years of drought, investigators said in an account filed in federal court. Ranchers rushing to the site of the fire saw Garcia who, despite the blaze raging over his shoulder, insisted he wasn’t aware of it much less responsible for it. Investigators punctured his story by matching footprints from the car to those of Garcia and his son. John Chatel, an endangered species specialist who led the Forest Service’s evaluation team after the fire, said it wasn’t the most damaging burn he has seen but added that the effects could last for years. 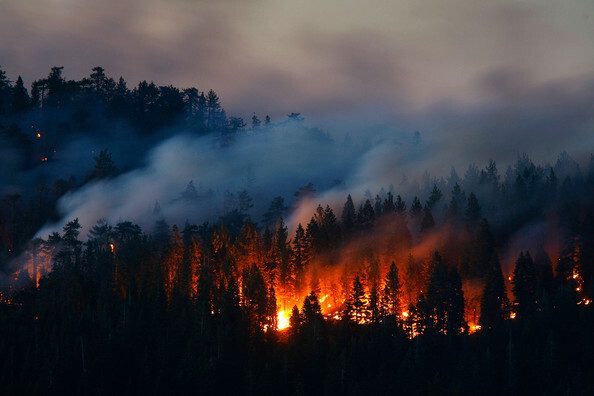 Of the 29,000 acres that were touched by fire, more than half sustained moderate or high-intensity burns. Communities were evacuated in two counties, and a handful of cabins and outbuildings were scorched. It took six weeks to fully contain the fire. Officials warned at the beginning of October that hot spots could persist until the first snows blanket the area and snuff out the last vestiges. 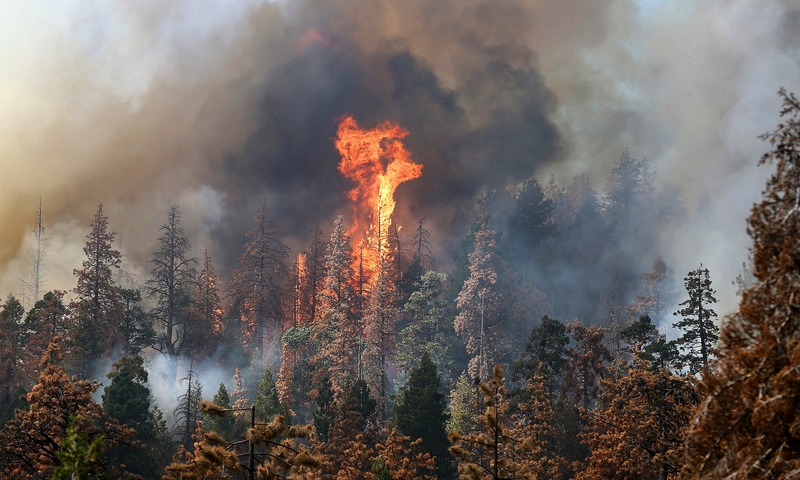 The fire didn’t spread to Sequoia National Park to the north of the forest, which is home to groves of the majestic trees. But it took more than $60 million to contain and extinguish the blaze. Mr. Chatel submitted an emergency restoration plan at a cost of $500,000. That doesn’t include long-term restoration of campsites, cattle-grazing areas and long-term revegetation. Mr. Chatel said the drought, now in its fifth year, probably will make it tougher for the forest to recover. Garcia has admitted to his role in the fire but shows little remorse. At one point while Garcia was talking with the ranchers, a glass methamphetamine pipe fell out of his pocket and he quickly moved to conceal it, Forest Service Special Agent Brian A. Adams wrote. Garcia claimed the Nissan Maxima, which belonged to his girlfriend’s mother, was stolen when he and his son went to get some water — though there is no water source anywhere in the vicinity, the agent said. Fires sparked by illegal immigrants are more common — and more controversial — along the border. The federal government’s main fire information center tracks whether blazes were sparked by humans but doesn’t record their nationality or legal status. Months later, the Government Accountability Office, Congress’ official nonpartisan watchdog, backed up the senator. GAO investigators reviewed 77 human-caused fires along the Arizona border and concluded that 30 of them were caused by illegal border crossers. Worse yet, the presence of the illegal immigrants made fighting the fires even tougher. One investigator told The Washington Times that armed agents had to accompany firefighters. In California, Kern County Sheriff Donny Youngblood said the problems go beyond fire. He said marijuana grows are becoming more frequent on federal lands. When they are raided, the grows are usually found to be manned by illegal immigrants — some of them forced into the labor. State and local law enforcement have become engaged in shootouts at the grows. “They’re destroying the landscape of our national forest,” the sheriff told The Washington Times. Garcia’s case illustrates the ongoing problem with the U.S.-Mexico border. Although less active than it was a decade ago, the border remains porous enough for bad elements to sneak across with apparent ease. That enabled Garcia to come back to his 4-year-old son, identified in court papers only by the initials G.G. Garcia has a long criminal record that includes auto theft, burglary and firearms charges. Nabbed last year after failing to appear in court to face felony charges, he was sentenced to more than a year in jail and was released for good behavior after serving 194 days. In the past, Kern County would have reported him to federal immigration agents and his criminal record and repeated deportations would have made him a priority case. But California’s Trust Act, signed into law last year by Gov. Jerry Brown, a Democrat, put an end to that cooperation. “We didn’t hold him because he did not meet the Trust Act,” Sheriff Youngblood said. Now that he is in federal prison, ICE will have better luck when he is released upon completion of a 13-month sentence to which he agreed in his plea bargain. But given his proficiency at sneaking back into the U.S., there is little sense that he will be deterred. She said families of repeat offenders in the country illegally could also be deported, removing the incentive for them to come back. Ms. Vaughan said targeting the smuggling operations that help sneak migrants into the U.S. would help.